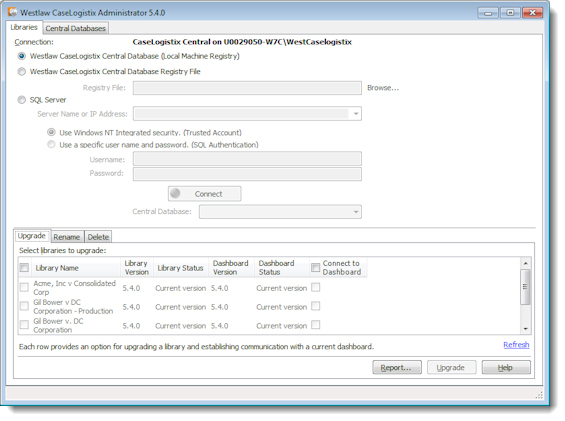 With Case Logistix® version 5.4, you can use the Westlaw Case Logistix Administrator to upgrade, rename, and delete libraries. To access the Administrator, click Start, then click All Programs, Case Logistix, Westlaw Case Logistix Administrator. The Westlaw Case Logistix Administrator is displayed. On the Libraries tab in the Administrator, click the Delete tab. In the Library to delete list, click the library you want to delete. Select the Remove database check box, if desired. Select the Remove Document and Index directories check box, if desired. Click Delete. A message asking if you want to delete the library is displayed.